In Orpheus Chanson’s world, geniuses and prodigies are no longer born or honed through hard work. Instead, procedures to induce Acquired Savant Abilities (ASAs) are now purchased by the privileged. And Orpheus’s father holds the copyright to the ASA procedure. Zimri Robinson, a natural musical prodigy, is a “plebe”–a worker at the enormous warehouse that supplies an on-line marketplace that has supplanted all commerce. Her grueling schedule and her grandmother’s illness can’t keep her from making music–even if it is illegal. Orpheus and Zimri are not supposed to meet. He is meant for greatness; she is not. But sometimes, rules are meant to be broken. Here is a thriller, love story, and social experiment that readers will find gripping–and terrifying. Two things really stood out to me in this novel. First I love the way the author used musical terminology to describe the world from Zimri’s point-of-view. Because of her affinity for music, this made perfect sense and added a lot of unusual, vivid detail to the setting and characters. I loved that. I also really enjoyed all the pop culture references tucked away within the story. Each one that I found felt like a bit of a nod to the artist or industry. I literally laughed out loud when Orhpheus’s dad says, “Isn’t it ironic, don’t you think?” And when Taylor Swift made headlines. In some of the dystopian boy-meets-girl stories where one is the wealthy elite and the other is from the wrong side of the tracks stories I’ve read lately, I felt like the hero and heroine weren’t well-matched. I’d find myself liking one way better than the other or wondering why on earth they wanted to be together in the first place. Not so with Gifted. I loved that Orpheus had such a strong character in his own right and that he had focus and dreams outside the box his parents wanted to carve out for him. I loved that his family weren’t just cardboard characters, too. They had real conflicts with each other and with him that made the story even more complex. I felt the same way about Zimri. I loved her musical talent, and that there was so much more to her. Her grandmother cracked me up and made me miss my grandmother. I think fans of Feuds by Avery Hastings will find a gritty dystopian universe here that rivals the Priors and Imps society of that series. Fans of Ally Condie’s Matched series will love the struggle for art and freedom in Gifted. Music lovers will enjoy the pop culture references and imaginative description of the future of underground music. In short, Gifted is a story with a lot to offer. Definitely a great pick for any summer reading list. I love the way the author uses character names throughout the story. The hero is named Orpheus, like the poet and musician from Greek mythology. Zimri means “song” in Hebrew. Orpheus’s sister is named Alouette, or “bird” in French, and she’s compared to a caged bird because of her comatose state. 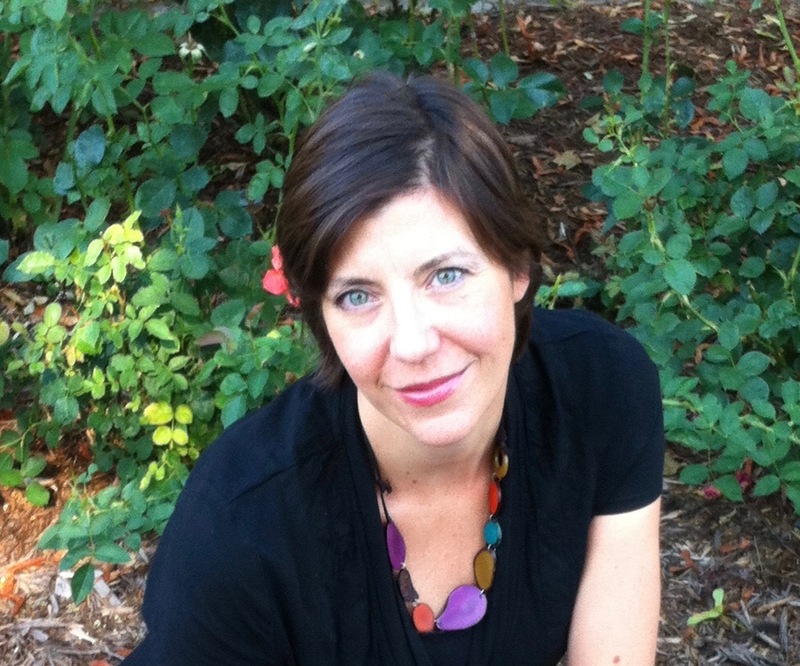 The author describes Orpheus and Alouette as having olive skin and dark hair. Zimri has curly hair and dark skin. Orpheus’s girlfriend Arabella has a surgery on her eyelids at the beginning of the story so that they look wider. Orpheus condemns the fact that her promotional team forced her to have the surgery to change her appearance. Mild profanity used infrequently. Some crude words used infrequently. A few brief kisses between a boy and girl. At one point Zimri’s boss makes her feel uncomfortable with a comment about making a good team. He places his hand on her thigh. Zimri’s father committed suicide years before the story begins. He jumped from a bridge. Zimri identified his body later in a hospital. A boy wrecks his car and nearly hits a woman standing in the road. If someone violates the law, enforcers punish them with a surgery that damages their brains and remove memories or abilities. Orpheus and his friends drink Juse, which alters their behavior similarly to the way alcohol does. After Orpheus disappears, rumors circulate stating that he had drug problems or a Juse addiction. A nurse sedates a girl prior to involuntary surgery. 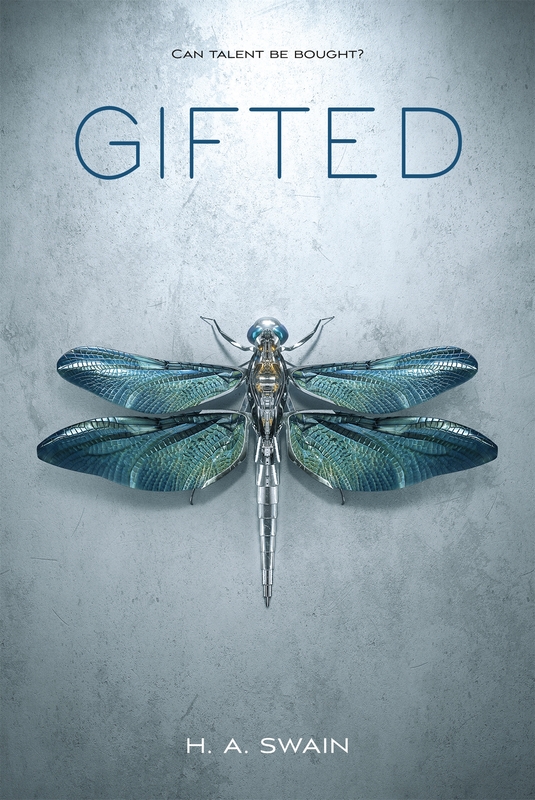 Enter to Win a FREE Copy of Gifted! 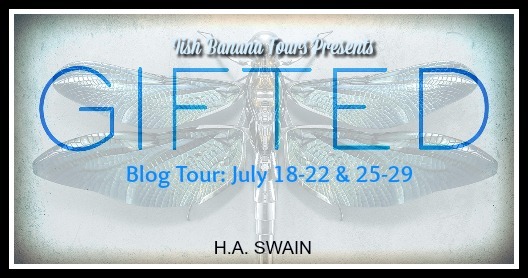 Tagged Feiwel & Friends, Gifted, H A Swain, Irish Banana Blog Tour, music in books. Bookmark the permalink. I love the cover!! This book sounds great!! There isn’t enough fiction based on music..
I’m a music person and so are my daughters. We’re going to love this book.